Alicia graduated in 2007 with a degree in Educational Sciences from UPEA and went to work in the administrative offices of Colegio Max Paredes. For the 2009-2009 school year Alicia interned at Carolina Friends School in North Carolina . Born in the City of La Paz, Alicia is the only child of her parents, Dianasio and Julia, who have a small farm in the Altiplano and also reside in the "Franz Tomayo” district of El Alto. Her father is a pastor of a large INELA church in El Alto. Alicia continuied working for BQE-Bo when she returned from the US in 2009. 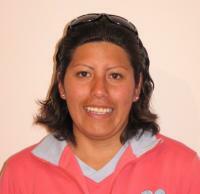 During 2010 she became co-director of the student residence in sorata, and in 2011 she took over as the director. She is now married and divides her time between sorata and La Paz. Submitted by Vickey on Mon, 09/29/2008 - 18:42.